Recruiting firm The Mason Group Inc. specializes in AV integration market recruiting and is looking to ease the industry-wide talent divide. Bryan Woodruff, director of audio visual recruiting, talks about The Mason Group's unique focus on AV integration market recruiting. The AV integration industry’s talent recruitment and hiring challenges are well-documented. What gets a lot less exposure are the challenges that individual AV professionals experience while trying to find the right next-step for their careers. In an industry in which familiar faces seem to bounce from company to company, from competitor to competitor, it can be hard for new faces to get their feet in the doors. That’s a problem for both sides, as integration firms look to bring in the best candidates, not the most familiar ones. The Mason Group Inc. is a talent recruitment firm that focuses on the AV integration market and aims to help both integration firm employers and AV professional employment candidates make the best connections possible for their companies and careers. Commercial Integrator talked to The Mason Group director of audio visual recruiting Bryan Woodruff about its unique focus? The Mason Group focuses on recruiting and placing AV integration professionals. 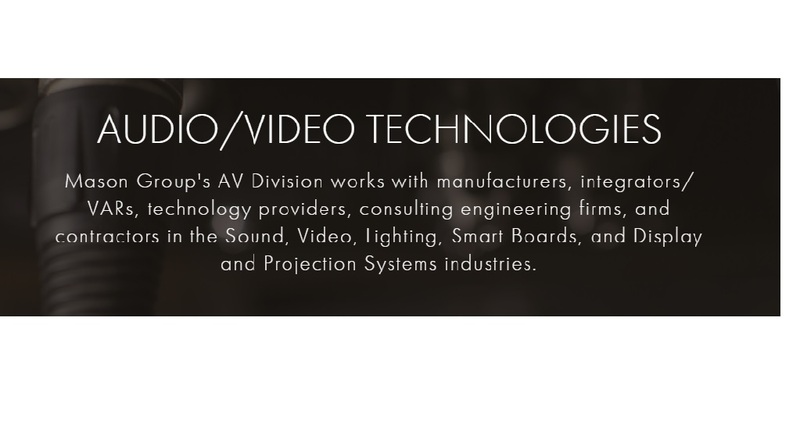 Why does The Mason Group specialize in the AV integration industry? Woodruff: Our focus is on the integration side of the industry, both on commercial and residential side. We like it that way because we can really hone in on the particular talent within the industry. We have a strong knowledge of the systems. We really get to know our clients and the type of work that they’re doing. That better understanding helps us understand as far as candidates go what they like to see, what sort of experience level, what sort of personalities — everything involved with that. What types of candidates is The Mason Group focused on recruiting? Woodruff: We really focus on the individuals in this industry that are installing; doing the engineering; doing the programming; sales management; or project management. I like for candidates to think of us as their agent. We will do all the heavy lifting. The whole focus goes back to knowing the integration side of the industry. For the most part our clients are looking for people who are experienced, maybe even certified in a particular system or technology, so that they know that the investment that they’re making on the candidate is going to be in somebody who is a direct contributor, who’s going to hit the ground running. We really do focus on working with the best of the best. For candidates, knowledge of which systems and technologies are most important? Woodruff: On the commercial side the big control system is Crestron There’s Extron. There’s AMX. These are the control systems that most commercial integrators are going to be focused on. Our clients might also want people with experience with DSPs. Biamp, ClearOne and [QSC’s] Q-SYS] are all brands some of our best [integration firm partners] have experience or certification in. What are the benefits of working with The Mason Group? Woodruff: I like for candidates to think of us as their agent. We will do all the heavy lifting. We’ll help you tweak the resume, scheduling for interviews, negotiating. We want to do all that for you. We also want to make sure that we’re getting your resume into the hands of the decision-maker. We have the best connections with the best companies in the industry nationwide. Why would you just submit your resume online or submit your resume to an HR intern so that she can add it to the stack of resumes on her desk in hopes that she gets around to giving you a call? Instead, have us – who have done business with them and with whom they have a professional relationship – hand-deliver the resume on s silver platter to a decision-maker.